+ FREE 50/50 Stainless Steel Undermount Sink! *INCLUDES INSTALLATION! This may not be combined with other offers. 49 SF Minimum within a 50 mile radius of our location. Restrictions May Apply. Subject to change without notice. (regularly $65 sf) + FREE 50/50 Stainless Steel Undermount Sink! *INCLUDES INSTALLATION! This may not be combined with other offers. 75 SF Minimum within a 50 mile radius of our location. Restrictions May Apply. Subject to change without notice. 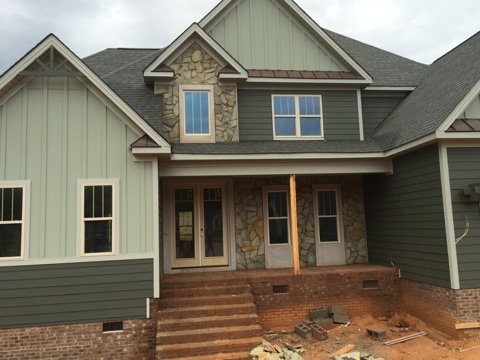 Take a look at this home recently completed for one of our builders. Sea Mist Stone Veneer used on the exterior along with Limestone window casing, filler areas, and around the door. In the interior of the house, 4" thick Limestone was used for fireplace columns, the mantel, and legs for the kitchen island. Notice the fireplace hearth has an oversized bevel edge. The Limestone was a great compliment to the Charcoal Format Ledgestone used on the fireplace as well as one side of the kitchen island. Would you like to consider including real stone in your projects at an affordable price? We can tailor your quote to supplying you with the materials if you have your own installers, OR we can include a labor price along with the materials if you would like us to install. Forward your house plans along with some details. We would be happy to put together a quote for your upcoming project.